You’ve heard of the country. The Americans dropped a squazillion tons of bombs on it in the Vietnam War (along with the several bazillion tons of bombs dropped on Laos of course). It was a French colony and it has had a wretched recent past, with parties from either side of the political spectrum in control. Huge quantities of land mines still dot the country (and if ever there was an argument needed for banning land mines, this part of the world provides it). So many people have been killed in Cambodia for what can only be described as crackpot stupid reasons that it saddens me each time I arrive at Phnom Penh. 40% of the population is either unemployed or living below the poverty line. Cambodia is famous in the developed world for the four G’s of guns, girls, gunja and gangsters. Two things cheer me though. One is the Cambodian people themselves. They have generally been pleasant and helpful to me on my trips into Cambodia. The second is the Cambodian way of doing some things. Here then, are my first impressions and some travel advice for those visiting Cambodia. Elsewhere, I will prepare a document containing a short history of the country. In the meantime, the following is offered as early impressions. If you are flying into Phnom Penh, the first contact you have with Cambodia is the runway at the Phnom Penh International Airport in Phnom Penh. The runway at the airport also serves as the taxiway. The plane almost comes to a halt at the end of the runway, and then throws a u-turn and taxis back to the terminal. OK, let’s see what awaits us when we get into the terminal. Cambodia runs a visa on arrival service. Unfortunately, I am not allowed to photograph in that area of the airport so you will need to trust my description of the process. The first thing to note is that if you are travelling to Cambodia and you are from a country allowed a visa on arrival, then travel with a photograph of yourself. A passport sized photo that is, not an 8×10 full colour glossy. There are two types of visa approved at the airport. One is for tourist travel and the other is for business. A tourist visa costs US$20 and a business visa costs US$25. There is also a departure fee payable (when you depart) and that is another US$25. It should be noted that the immigration department in Cambodia will generally extend a visa, the advantage of a business visa is that it is easier to get longer extensions than a tourist visa provides. The tourist visa is normally extendible once, the business visa unlimited times. Now, on to the issuance of the visa; as you walk down the steps into the immigration area of the airport there is a long counter. Approach the counter. Behind the counter will be sitting about 8 people. If you have completed your visa application form, approach the person second from the left (the counter is actually divided into two sections, so go for the left most person of the right side section). Pass photo, forms and passport across to that officer then move to the right side end of the counter. Your passport and visa application moves along the production line, each person doing one small step in the process, until the passport plus visa reaches the end of the line. Here you can pass over the money then head to the immigration desks to have your visa checked and get stamped into the country. Grab your bags and head out into Cambodia. Thomo on the back of a Motodup - there is a rider there too! A taxi is, well, a taxi. A motodup (or ‘moto’ for short) is a small engine motorcycle, around 100 to 150 cc in engine capacity. The moto is used in the same way a taxi is, although there are no meters (actually, there are no meters in the taxis either). 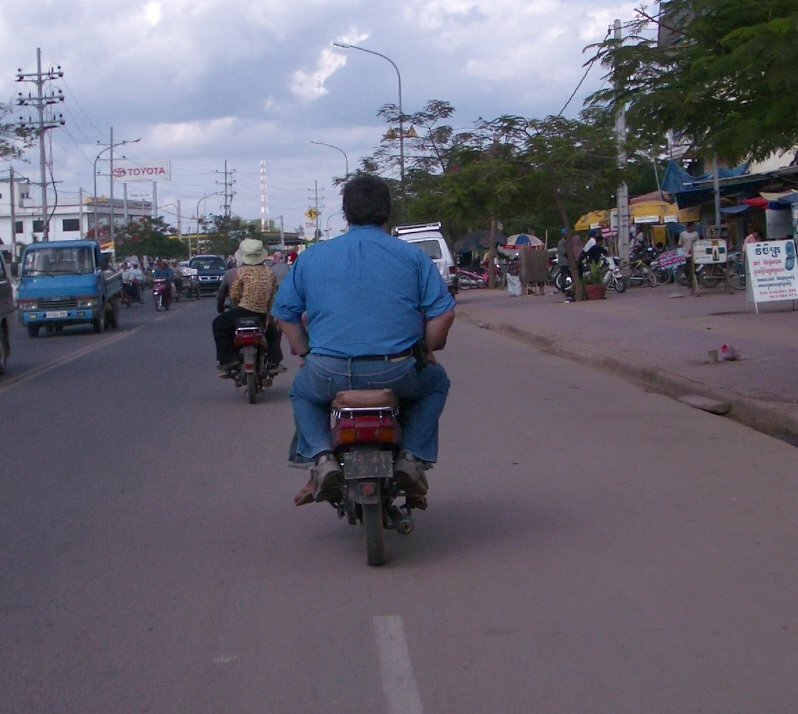 Trips around Phnom Penh are fairly quick on the moto and inexpensive. You can generally tell which motos are the ones for hire as the driver wears the standard uniform in Phnom Penh of a baseball cap. Usually if you walk out on the street near corners, the moto drivers will make themselves known to you. There are also bicycle-powered rickshaws for hire around town although I have not used them. If you are bar and restaurant hopping for the evening, then I would recommend that you use the same moto driver all night. My driver normally costs me about US $5.00 or $6.00 a night – from 7:00 pm until 1:00 or 2:00 am the next morning. I would also normally give him a little extra for later nights. If you work on about $1.00 per hour for the moto, then he will generally be very happy with that. Your moto-man will also be happy to ride you around the tourist places and destinations as well. Again, for an afternoon, about $5.00 will do (buy him the odd Coke or Sprite, usually when you need one as well). The advantage of buying his Sprite or Coke is that it means he wont buy himself a beer. You have been warned. The advantage of using the same rider all the time, especially at night, is a combination of you knowing his riding style and safety. Phnom Penh is still a little bit of a frontier town. Gunfights between the police and the bad guys are not unknown in Phnom Penh and robberies do occur. Normally your moto-man will keep you away from that as much as possible but remember there are many locations in Phnom Penh offering coffee and TV. Why? Well, not many Cambodians can afford a TV so there are coffee shops around town providing that service. Your moto-man may, therefore, just want to get closer to a shoot-out to watch – a product of not having much TV. The simplest method to coming in from the airport is to arrange for your hotel or guest house to meet you at the airport. Most guest houses and hotels can arrange that service and in many cases it will be a free service, at least one way it is free. If not free, normally the fee is around $7.00. When exiting the customs area then, look for your name or the name of your hotel or guest house. Thomo does not like travelling with lots of cash on him, so generally he enters countries with US$100-200 on him. He figures that it is easiest to just slip up the road to an ATM and make a cash withdrawal there – cheap, easy and minimises the amount of cash you are carrying. There are only four ATMs in Phnom Penh. Yep. Just the four. And they are only connected to the accounts of that bank (Canadia Bank by the way). They are not connected to any other system or network yet, that is something planned for the future. Bring cash. Mind, if you do run out of funds, do remember that you can use your Visa or MasterCard to access more cash from the Western Union branches around town (this is efficient and effective although the fees are a little high – 5% or US$5.00 minimum at the Western Union Office, plus the revenue generating exchange rate Visa Central or MasterCard applies for the exchange of dollars back to your own currency, plus a foreign currency conversion fee from your own bank and lastly, probably a foreign bank cash advance fee from your own bank as well). Remember to take your passport with you. Western Union counters are available in several banks. The Canadia Bank has plans on opening another 6 ATMs across Phnom Penh and I believe that later they will be applying to connect them to the MasterCard Networks internationally. Note that Cambodia is a true dual currency country. Both Khmer Rial (KHR) and US Dollars (USD) are in use (the Khmer Rial is, of course, the official currency). Prices are normally noted in dollars and whilst there is not a fixed exchange rate between Rial and dollars, a rough rate of KHR 4,000 = USD 1 is used across the country. As this means KHR 1,000 = 25 cents, when you buy something for $2.50 and hand a $5.00 note over, you will receive change of $2.00 and KHR 2,000. Do check and make sure that the dollar bills are not defaced or torn at all (even the smallest of tears) as the locals always do and they may then be difficult to pay bills with. Phnom Penh has thousands of places selling telephone cards. Cambodia is a developing country and generally, in developing countries, coin operated public telephones are very popular. However, in Cambodia, telephone cards are the most popular way to access the phone system. The reason? Well, in its currency, Cambodia has no coins, hence the phone cards. Probably also explains why there are no coin-operated laundries or parking meters. This is about 15km south west of the city. Over the period 1975 to 1979 the Khmer Rouge under the infamous Pol Pot controlled Cambodia. During that period, around 2,000,000 Cambodians died. Note that no one is really sure of the numbers, just that the scale of death was immense. Many of the dead ended up here, in the “Killing Fields”. About 17,000 Cambodians were executed here. If you visit no where else in Cambodia, visit here. Near the Royal Palace, the National Museum has a collection of around 5000 objects from the Angkor Wat period of Cambodian History on display. There are many pagodas throughout Phnom Penh. There were originally five pagodas in 1422 in Phnom Penh. The more famous ones around town are Wat Botum, Wat Langka and Wat Ounalom. Inaugurated in 1958 in celebration of independence from France, this monument is in Phnom Penh itself. Restaurants, bars and lovely colonial French architecture are found along the river front. Remember, in Phnom Penh, don’t walk on the grass – the grass is there for decoration. I can recommend the pumpkin soup and pizza at the Pink Elephant. Toul Sleng was a high school. When the Khmer Rouge came to power, they turned it into an interrogation centre (I guess interrogation is a polite way of saying torture). Inmates were questioned there then taken out to the Killing Fields for execution. The school has been preserved as a museum. This is a disturbing place as well and one that perhaps I would not bring the kids to. This is well worth the visit as well. The palace was built in 1866 under the French protectorate. The silver pagoda (Wat Preah Keo Morokat) is famous for the 5000 silver tiles covering the floor as well as the other cultural treasures such as the “Emerald Buddha”. You’ve all seen it on CNN … the images of characters in some war zone or other, behind a wall, holding the AK47 high in the air and firing in the general direction of troops on another side. Ever wondered what it felt like to fire an AK47? Now I need to note here, up front, that even though Thomo has Wargaming as a hobby, Thomo also is not in favour of people having guns laying around ready for people to pop other people off with. However, Thomo had never fired an AK47 either … until Phnom Penh. On the edge of town is a training area. It is not listed in the tourist brochures but is commonly known in Phnom Penh. Hotel concierges’ and motodup riders know where it is. There, for the price of US$20.00, you can buy 30 rounds for an AK47. The guys running this area are cautious and generally ensure that you cannot do anything too silly like hurt yourself although remember that where any firearms are involved there is always some risk. So, for your $20 you get 30 rounds. You are taken into an enclosed firing range where the nice man shows you which way to point and sets you off on single shot. After 4 or 5 single shots, he changes the switch on the gun to automatic, makes sure you are pointing in the right direction and invites you to depress the trigger again. The remaining 26 rounds disappear in a flurry of smoke, smell and loud (and I mean LOUD) popping noises all within a couple of seconds. It is at that point that you start to get an understanding of the power that is inherent in automatic weapons like that. It was a fun 30 seconds but not one that I would repeat. I can recommend visitors trying it once though. There are other weapons available, including pistols, American automatic weapons (M16s? ), machine guns and … hand grenades. Also on the edge of town is an area known as the Vietnamese Village. This area tends to the seedier side of life, with much of its income from exploitation in one form or another. It should be noted that a great number of the people living there are from outside Cambodia. They come for three months, or six months, and then return to their home villages. It was also an area popular with paedophiles. Paedophilia is one thing I hate with a passion. The Cambodian government along with the UN is battling paedophilia and it is a battle I am happy to support. Over 780 people have been arrested and prosecuted for paedophilia in an ongoing battle. The fight against paedophilia, however, is a hard one and one that is made all the more difficult in places like Cambodia due to economics. Cambodia is poor. The western governments are not effective at providing aid that generates income for the people, rather preferring aid that is visible. When income levels across the full population in Cambodia rise and more people move above the poverty line, then the battle against paedophilia will be more effective, and the developed nations (US, UK, Europe, Australia and so on) will no longer be able to export their paedophilia problem to this developing nation. OK, so some things do steam Thomo up and this is one. Phnom Penh is located at the confluence of three rivers (there are four arms as two rivers join into one then splits into two). The rivers are the Tonle Sap, the Bassac and, of course, the mighty Mekong. 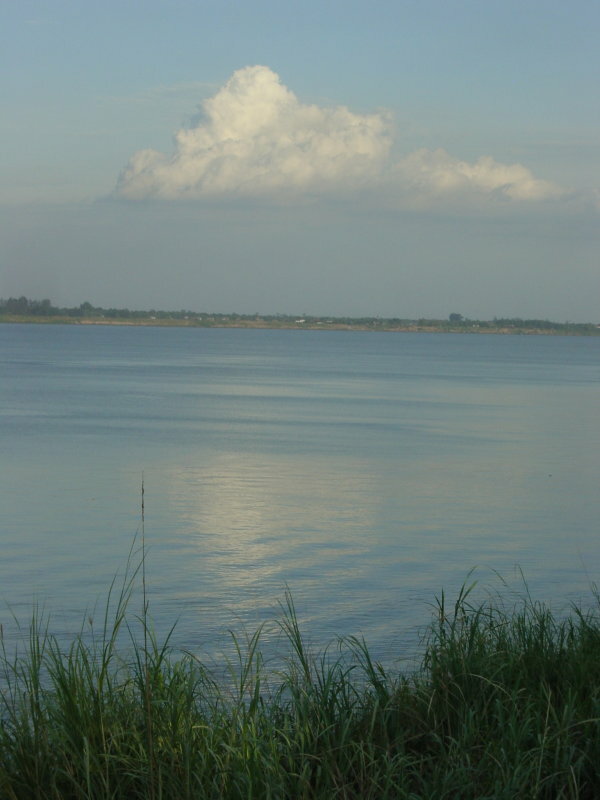 The main part of the city is on the western side of the Tonle and Bassac rivers. However, a ride by moto across one of the bridges takes you out of Phnom Penh proper and into a semi rural and entertainment area. You will ride past many restaurants and clubs. Eventually you will come to restaurants and such on the edge of the Mekong. There will be some photos of that area included in the Photo Gallery of Thomo’s Hole in the next couple of weeks. Yep, there is one. There are restaurants, pubs, bars, discos and more blue places in Phnom Penh. All are easy to get to and the simplest way is to take moto or taxi (again, moto has the advantage of being inexpensive and the driver will wait for you). Note that the discos really do not start to get going until late, around midnight. They will continue to 3 or 4 in the morning. Drink plenty of water too; it is hot there, even at night. The best bet is to explore. Generally starting around the river front is good for the foreigner as it is well lit and there are lots of bars and restaurants within close proximity. I can also recommend heading to the Foreign Correspondents Club of Cambodia in Phnom Penh. They serve good food, cold beer and have a lot of expatriates present making it easier to obtain local information. A History of Cambodia by David Chandler, an Australian academic who has written a fair bit on Cambodia. It is a readable history of Cambodia, principally covering the period up to about 1993, starting around the time of Funan. It manages to remain fairly even-handed as well. A more disturbing read and one that reminds of the cost Cambodia has paid for its recent history is First They Killed My Father: A Daughter of Cambodia Remembers written by Loung Ung. This chronicles the brutality of the Khmer Rouge in Cambodia, from the author’s forced “evacuation” of Phnom Penh in 1975 to her family’s subsequent movements from town to town and eventual separation. There are many Internet Cafes in Phnom Penh and these are inexpensive. If you are travelling with a laptop, there are also a number of WiFi hotspots in Phnom Penh and Siem Reap, generally in the bigger hotels, the airport at Phnom Penh and the Lucky Burger Branch on Monivong in Phnom Penh. Perhaps the most exotic location for WiFi connections to the world is the Foreign Correspondents Club of Cambodia, on the river front in Phnom Penh or the FCC Angkor in Siem Reap. Cool location for a gin and tonic in the evening as well. OK, there you are – first impressions of Cambodia. It is a country well worth visiting but remember to be a little more careful perhaps than you would normally be and at the same time, be a little more patient with the locals. When things do not work right, well, they are trying to get there. Do note as well that if you travel to Cambodia at the end of the hot season (April and May) that there may be many power cuts (brown-outs) which translate to “no air-conditioning” for four or five hours. The wet season (from June onwards) is cooler.